Just like in life, change happens in sports. Typically, these changes, such as simplifying rules or modifying things that already exist, are small and quickly become a normal part of the game. However, every so often these changes revolutionize how we play the game. Examples of such instances include the forward pass in football and the three-point shot in basketball. The Intercollegiate Division of the NWBA recently passed legislation that, while it might not reach the revolutionary impact of the changes mentioned, will, hopefully, have a positive long-term effect on the growth of wheelchair basketball at the college level. The key to this working and not being abused, in my opinion, is that like most adaptive sports at the highest level, the NWBA’s Intercollegiate Division uses a classification system to ensure fairness and allow individuals with a wide range of disabilities an equal opportunity to compete. The classification system used by the NWBA ranges from 1.0 to 4.5 with 1.0 being the most impaired while 4.5 is the least affected by their disability during play. Furthermore, the amount of points on the floor at one time, for all five players, cannot exceed 14.0. The classification system still applies to these teams and able-bodied athletes count as 4.5s. During competition, there must be more individuals with disabilities on the floor for a team than able-bodied individuals (so a maximum of 2 able-bodied athletes are allowed at a given time). Additionally, the high value assigned to able-bodied athlete’s means that a team must be careful how it manages its lineups across the board as teams want to be able to field a legal lineup. Able-bodied players must be enrolled as students at the team’s institution. This differs from another measure passed allowing community players (non-students) on expansionary teams since these community players must be disabled. The aim of this change is to help grow the sport at the intercollegiate level. Despite the consistent growth of both the Junior and Adult divisions of the NWBA, the Intercollegiate Division has failed to expand at a proportional rate. Out of the 220 teams registered with NWBA for the 2015-16 seasons only 13 teams (9 Men’s and 4 Women’s) are members of the Intercollegiate Division. I think this is a step in the right direction concerning the growth of the NWBA’s Intercollegiate Division as it gives more teams a chance to find their footing. A larger number of intercollegiate teams equal more opportunities for athletes with disabilities hoping to compete at the college level and these teams also will, eventually, offer scholarships just like established programs currently do. These opportunities help further the education of these athletes and provide the benefits of a college education to these athletes. What are your thoughts on this new legislation? 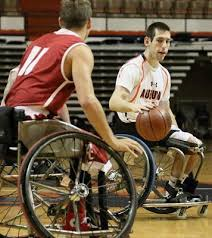 Are you opposed to the idea of able-bodied athletes playing adaptive sports at the college level? I am all in favor of inclusive adaptive sport at all levels. I feel that a truly inclusive nation allows for people without disabilities to participate in all adaptive sport. Definitely agree. However, I think the key is the classification system. Without it, I don’t think it works fairly (Someone would abuse it for the sake of winning). For that, I don’t think the junior level should adopt this measure.